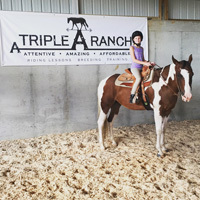 Triple “A” Ranch is a brand new training and breeding facility located in Franklin, Tennessee, on 50 acres of beautiful rolling hills with 3 ponds and a woods. We specialize in Western Pleasure and Hunter Under Saddle riding lessons FUN, EXCITING, MEMORABLE, FRIENDLY and a great learning experience. Most importantly we have safety on our minds at all times. We welcome all ages and all level of riders. 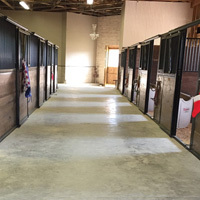 Our Facility has 13 stalls, 2 wash bays, a big tack room, a great viewing room, a 72' x 182' indoor arena. We have run outs and lot of pastures on our 50 acres of land. We are Attentive, Amazing and Affordable. EVERYONE is welcomed! Agatha Dumford went to Blackhawk College in Illinois for two years where she studied Equestrian Science and Horse Technology. 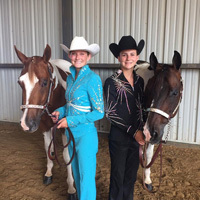 After two years of schooling she graduated with honors and received her associates degrees in Equestrian Science and Horse Technology. 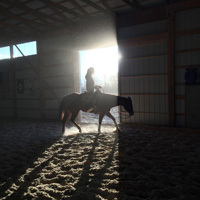 She has been riding competitively for 20 years. She has ridden since she was 7 years old and has been all over the world with her Paint and Pinto horses. She has competed on The Michigan Paint circuit, Michigan Pinto Circuit and Indidna Pinto circuit and did 4H and some smaller local shows. She is a multiple state champion and a multiple World Champion at the Color Breed Congress in Oklahoma.